This dip is creamy and spicy and fluffy and flavorful and you’d never guess in a zillion years that it had any cauliflower at all in it. It’s a great way to health things up with no compromise in flavor. The only had part about this recipe? Refraining from munching on the cauliflower before it gets to the blender! Feel free to double the recipe and/or adjust any spiciness to your own taste. This DOES have a bit of heat, and it is sneaky heat. The more you eat, the hotter it is. I won’t leave you high and dry without a shopping tip or two. Watch the sale prices on cauliflower and whether it is sold by the pound or as a unit. Look for tahini in the grocery store when specialty items go on sale, usually around holidays or you might want to paw around in the discount/close out bin if your store has one. Put 1/2 cup water in a blender with roasted cauliflower and remaining ingredients. Blend, adding more water if needed (up to 1/4 cup) and scraping sides often, until you have a creamy purée, about 4 minutes. Taste and add more salt or lemon juice if you like. Spoon into a serving bowl and drizzle with a touch of olive oil and sprinkle with a pinch of smoked paprika and red pepper flakes. May be made ahead several days, stored in an airtight container in the fridge. This entry was posted in Click here for Fabulous Food Posts and tagged Appetizer, Cauliflower, Easy Recipe, Frugal Hausfrau, Hummus, oven roasted cauliflower, Spreads and Dips, tahini. Bookmark the permalink. 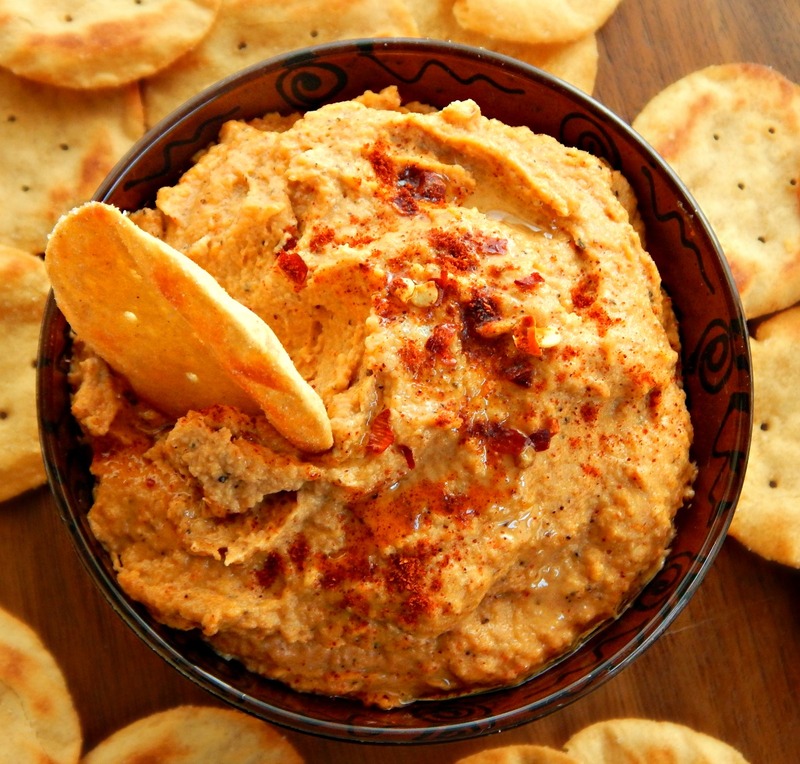 Not exactly hummus without chickpeas, but it looks like a yummy cauliflower dip! You’re absolutely right, but…maybe we’ll put it down to poetic license:) And it was delish! Mollie– this is genius! I love humus and this sounds like a delicious new slant! I make snacks every Monday for a group who come in– this would be perfect! What’s next?? more cauliflower dishes??? You are so inventive!! hugs! lol, Rhonda! I might be cauliflowered out for awhile! 🙂 We shall see! hugs back at you! Thanks! It was a fun creation! What a lovely take on the classic. I love cauliflower, must try this! It took a while for the cauliflower to get smooth but it was so creamy and delish – personally I thought it was better than hummus with chickpeas. Creamier. Ohhh! I love this, Mollie. I’ll be making this! Yay! Can’t wait! Thanks Jhuls! It was a big hit and even the cauliflower “haters” loved it! This looks yummy Mollie and what a way to use cauliflower – I will be making a big batch of this very soon! I am constantly amazed at what can be done with cauliflower…I hope you like it! Lovely! You’re reminding me of my past cauliflower creations, I need to go back and make them all again I think! I always love to see your creations! You do such amazing things with veg and spices! Oooh, what a fun idea! I definitely need to give this a go. I haven’t made hummus and now I’m hungry for some! Thanks, Carlee! We’re having company so I felt obliged to try it out ahead of time and scarf a good portion of it down myself, lol!! This sounds fab!! Can’t wait to make it! Hi Diane, it was (if I do say so myself, lol!) Plus I love to sneak veggies in food whenever I have the chance! Have you bought stock yet in cauliflower? LOL. This looks absolutely delicious. I always forget to buy tahini when I’m at the store. I’ve made hummus without it but it just wasn’t as good as I thought it should be. I love that you made it with cauliflower instead of garbanzo beans! It was a really nice change up and this came out so creamy. I went pretty heavy with the smoked paprika and spices and then served it with sweet potato chips. Your pix are awesome and the dip looks tasty! I’d probably eat most of that if it was in front of me at meal time! Thanks so much! When I’m at my house I’d often just nosh on something like this for dinner or even breakfast, lol! At my folk’s house (where I’m helping out a lot) they want 3 square meals…at 8:00 am, 12 noon & 5 sharp. So if we have appetizers, it’s like 3:30 in the afternoon! Well I guess anytime is good for this dip. It’s great with cucumber slices, too! I love cauliflower..this looks yummy! Hi Laurin. It’s hard to believe some people are “haters” isn’t it? There’s no end to what can be done with it. You’re a dear and you just make my day all the time! But Angie, Pineapple and greens? Why not cauliflower, for instance, lol! !